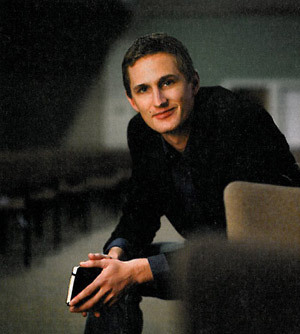 Biola University’s Torrey Honors Institute alumnus, Matthew Lee Anderson (’04), “is at the head of a class of young Christian intellectuals who sharpen their minds by way of the blogosphere,” wrote Christianity Today in their December 2009 issue. Anderson’s education at Biola contributed to the intellectual and integrative thinker he is being recognized as today. Since 2004, the twenty-eight year old has been furiously cooking-up thoughts, ideas and distinctions at his loyally read blog, Mere Orthodoxy, which also showcases contributions from Biola alumni Jeremy Mann (’08), Cate McDonald (’06), and Gary Hartenburg (’01). At “Mere-O”, readers are served substantial contributions on technology and culture, anthropology, politics and political philosophy, theology, spiritual formation, philosophy of education, along with deep appreciation for Anderson’s hero, G. K. Chesteron. While Mere-O is Anderson’s abode, his thoughtfulness is a winsome read at ConversantLife.com, First Thing’s Evangel blog, and The Evangelical Outpost. For some time, Christianity Today’s Senior Managing Editor, Mark Galli, was attracted to what was cooking at Mere-O and also what Anderson had published at Civitate, a publication of Houston Baptist University that features leading voices in Christian academia on the critical issues of the times. Shortly after the December Christianity Today profile ran on Anderson, the U.S.’s top-circulated Wall Street Journal, ran a “House of Worship” column by Jonathan Fitzgerald, managing editor of the post-evangelical outlet, Patrol Mag, where he used Anderson’s article as an example of how thinking about the “evangelical mind” has been stimulated in recent years. His apparent intellectual, truth-telling commentary and intolerance for false dichotomies has captivated Christian bloggers. In early 2009, Anderson daringly published an article, “The New Evangelical Scandal” (an allusion to Mark Noll’s landmark book, The Scandal of the Evangelical Mind) in a Winter 2008 issue of Civitate. In that article, he showed how 20-something, young evangelicals are not substantially different from the previous generation; often ahistorical, individualistic, and avid consumers of culture much like their parent’s generation, which they routinely protest. In his development, Anderson recognized that Christianity is a knowledge tradition and not merely a faith tradition, which is a common theme in Dallas Willard’s writings and highlighted in the talks and writings of Biola professors like John Mark Reynolds, William Lane Craig, Craig Hazen, and J.P. Moreland. As a knowledge tradition, Christianity can credibly engage the public as a worldview, since its tradition is open for all to test, experience, and recognize as true. And being in the public where Christianity is, is exactly where Anderson has been, whether those publics are the blogosphere, lecturing for Torrey Academy, leading Wheatstone Academy, or working at Thomson Reuters. When Anderson was a student at Biola, he came to appreciate the value of thinking historically, the importance of the body to human experience, and how Christian anthropology significantly forms our worldview. In December 2009, Anderson signed a book contract with Bethany House, a division of Baker Publishing Group, “to write a book on the meaning and role of the body in young evangelicalism,” a project which originally grew out of a senior thesis with Biola’s professor Moyer Hubbard and other academic papers with professor Fred Sanders. Clearly, Matthew Lee Anderson is an integrative thinker, whose intellectual and moral-spiritual well-being was trained and nurtured at Biola’s Torrey Honors Institute. The solution, educationally, is robust training in worldview integration, which would emphasize learning to “think Christianly” about reality, knowledge, ideas, people and life. But being in a “worshipping community,” and not merely an educational community, is where learning is best done, according to Anderson. “My best days of class were the ones where I went to chapel (which I actually did regularly),” Anderson said. What can knowledge institutions like the Christian university, seminary or local church do to address the “New Evangelical Scandal”? That’s not a simplistic answer. It is a wise answer, but not because it is religiously correct. It is wise because it recognizes how all human life is meant to be led: knowledgeably and Christianly. Matthew and his wife Charity (also a Biola alum) currently live in St. Louis, Missouri and are the leaders of their local Biola alumni chapter. Written by Joseph Gorra, Christian Apologetics. Jenna Bartlo, Media Relations Coordinator, can be reached at (562) 777-4061 or through email at jenna.l.bartlo@biola.edu.